Of course it’s good, it’s A.D., but I liked the last installment a little bit better…more of an emotional tug. I think I like this one more, especially the detail of the feet in the bathroom before we see he’s running a bath, and the anger and desperation in panels 14 and 15. What facial expressions! Great stuff. I love the little details of regular people, how we know what’s coming to them and they don’t. Isn’t there an English class term for that? I’m still don’t want to know what happens to all the dogs. Chapter 3 is awesome. I like how Kevin’s got a Bible sitting on top of an issue of Maxim—that’s a nice touch. The panel with the dogs and cats trapped in their domestic cages was harrowing. The sunken SPIDER-MAN action figure…how apropos. Last week it might have been a plastic toy. This week, with all the hype concerning the release of the third movie in the franchise, it resonates like a ton of bricks…a fallen hero…a totem…a warning of things to come. A.D. is your opus, Josh. From your favorite tv show [M.A.S.H.] to your favorite subject [Vietnam Nam] to your personal travel comix [KEYHOLE, A FEW PERFECT HOURS, THE VAGABONDS] to your “Katrina Came Calling,” this is all coalescing into one paramount tapestry of awesome. My only complaint about this finest of your works is that you always leave me wanting, needing to read more. The mood is cut with sensitivity and attention to detail that lets A.D. stand tall above so many other comics. I’m with this until the end, when it can live on my bookshelf. I love the use of the open panel when Nadia is hugging her dad, it really made that moment stand out for me. I also love the use of purple, the color of sexual frustration. It increases the metaphor. 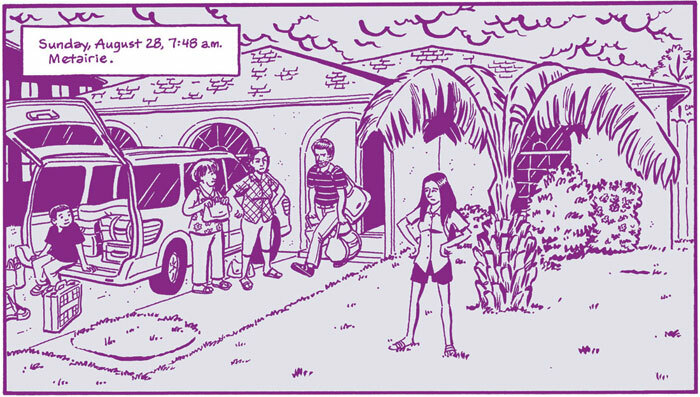 Man, that panel with all the dog carriers… It just captured the surreal aspect of the awful situation. I’m really enjoying this series. Please keep me informed as to your plans for any printed version. My mag, COMIC BOOK ARTIST, should be back on its feet soon, so whatever I can do to help you promote A.D., please don’t hesitate to gimme a shout. Holy Cr@p! This is good! Batten down the hatches! To Leah: The term is foreshadowing. What a superb comic. I know how it turns out and I’m still on pins and needles. As a Nawlins boy this is very emotional! I love the artwork especially all the references to real places and real characters. Storytelling at its best! This should be required reading for school kids. Josh, I was an RN in labor and delivery at Baptist and worked during the storm. I’m finding page 14 of Chapter 3 a bit upsetting where there was a surgical tech not getting a room because nurses were given highest priority…do you know if this happened exactly as you depicted it? I actually got kicked out of my single-bed room and had to go in a very crowded room with a bunch of other nurses…the best couple hours of sleep I got was in a supply room on a deflating air matress. And one of our secretaries had the biggest room with her family and even neighbors in there. I don’t think it was all hierarchical in the way you showed (I think it was hierarchical in other ways), but maybe you know something I don’t. I find myself cobbing together a more and more complete picture of what was going on as time goes by. But we were a pretty tight-knit group up there, and it upsets me that a tech would have been told that. I’m wondering who that tech may have been, too. Or are some details changed to keep identities private or something? Hope you fill me in. Thanks. Oh- enjoying the story! Thanks. I left the hospital because they told us we were going to have to give up our room for two nurses who showed up late. I was very angry. They also threatened other techs who had been there all day and settled into rooms that they were going to have to give up their rooms too. I was not the only person who left because of this occurance. another person to it. I was then angry with myself for not having the patience to stick it out. As you can imagine, enduring Katrina at home alone was terrifying. As to the racial component, the people who were asked to give up their rooms were black, the people who were being accomodated (even though we were all told to be there at 11:00 am and they showed up at 8:45 pm) were white. Draw your own conclusions. I’m hoping the outcome isn’t typical. Thank you for replying to my questions, Josh and Denise. Denise, I can’t help but keep wondering who your mom is! I definately know her if she was she a tech up on L&D. When I left Wed. on an airboat, 3 of our techs were on it, as well. There were a lot of inequities all around, everywhere. I was very angry, too, when I was kicked out of my room. And about other things. Still am angry about some of it…the room situation pales to some stuff. And I believe my race (white) effected how I got out of the city, and while I’m grateful to those who helped me, that aspect of it causes me discomfort as well. I can’t imagine what it would have been like to ride out the hurricane at home. I hope you’re doing OK. And I’ll look forward to the rest of the story. My mom is Louise. I have not shown her this comic, so don’t tell her about it. We have been wondering where the white people ended up after the evacuation from the hospital. What happened to you guys? I hope you get over feeling bad about getting out. I am glad some folks were spared. It wasn’t pretty. We are all okay now. I hope you and yours are well. Oh, I’m glad to hear your mom is doing OK…I haven’t seen her, but if I do, I won’t mention this comic. The staff ended up in different places from what I know-the Convention Center, the Causeway, the airport. I got dumped at the Convention Center on Wed. at about dusk, but left on foot with a small group of people I had just met. We started out walking across the GNO, and were lucky enough to be picked up by some guys who had come over from the West Bank to help out. I had such a bad, bad feeling about the C. Center. It shouldn’t have worked out so well for us to walk away, but I’m grateful for how it went down. A group of three techs also left the Conv. Center and hid in a mail truck. One of their husbands worked on the boats, and they managed to call him and he got the National Guard to rescue them. I called the L&D floor after I first arrived there to plea for help (which they couldn’t give me) but it led other staff members to refuse to leave on the airboats and to wait for hellicoptors…so at least I may have helped a few others avoid the Convention Center. Again, so glad to know your mom and you all are doing well. Take care! I liked this one, especially the ending because you could see the emotions in peoples’ faces. i wonder if these dogs were left behind or from a shelter?